The idea of using online services to meet offline friends is one that many startups have tried and died over. “How big is the “social discovery” opportunity?” I wrote in a story in 2011, about a bunch of companies whose names have already been forgotten. One of them was GrubWithUs, which promised to matchmake family-style meals at restaurants so people could meet and bond over food. Los Angeles-based GrubWithUs raised a bunch of money — $7.7 million — for the idea, but the reality is that it wasn’t working. “There are barriers to getting people to go out to a meal,” said co-founder Eddy Lu. He said the site had about 100,000 members, and the active ones were using it to arrange private meals and make wish lists of restaurants they’d like to try. 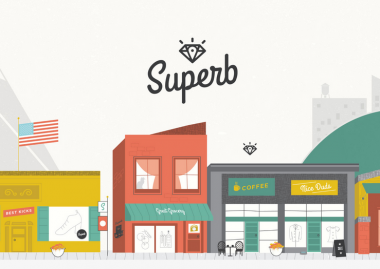 So, Lu and his team are taking the money they have left, shutting down GrubWithUs, and relaunching as Superb, a mobile app for making lists of places. An iPhone version is supposed to launch by the end of the year. Though at this point it’s pretty obvious what features would be included in a bookmarking app, Lu notes that people will be able to organize, share and discover places they love and want to try — not just restaurants, but also things like beaches and murals and shops — all oriented around where the places are located. Here’s a gif of the Superb product under development, which is a cool way to see what’s going on, if it doesn’t get your head spinning too fast. Lu admitted that there’s lots of competition: Foursquare has lists, Yelp has lists — but he said those are “secondary” features. Pinterest, the biggest bookmarking site of them all, just launched its own location and travel feature. Plus, there are dedicated local-discovery apps like the city-focused Sosh, which is doing well enough to have raised another $10 million this summer. But Lu said he thinks there is an opening to create an “actionable lists” product. While so-called “pivots” often happen when startups are trying to salvage themselves for a sale, Lu insisted that’s not what’s going on here. “Our investors have been very happy with what we’re doing and what we’re trying,” Lu said. “This is not a departure from any of that, and we still have over half the money in the bank, so there’s still a long runway.” He did admit that the GrubWithUs/Superb team is now down to 12 people, from a high of 15.